In the past, white phosphorus was used to make matches. The matchmaking industry workers were given insufficient safeguards while working with yellow or white phosphorus. It was noticed that workers inhaled the phosphorus fumes during match-making process. The phosphorus matches were health hazards; as a result the workers suffered from jawbone infection “phossy jaw”. The sufferer of Phossy jaw experienced deposits in the jawbones, swelling of gums, throbbing toothache and blister in the jawbones. Moreover, the disfigurement of face, tremendous pain and stinking discharge from bone tissues were some of the snags faced by the Phossy Jaw sufferers. Nowadays, the hygiene practices are implemented in occupational industry for the safety of employees. Phossy jaw is work-related disease, which is formally known as phosphorus necrosis of jaw. Vapors of the phosphorus stream in the body and mix with chemicals to make biphosphonates. Osteoclasts and osteoblasts are the cells that help in remodeling the bones. Biophosphonates makes these cells poisonous; therefore the process of remodeling the bones gets discontinued. The alveolar bone in jaws reforms rapidly, thus this part is highly receptive to toxicity. The jaw bones cannot get nutrients and required blood flow, therefore depart their life. In 1988, the London match-girls went on a strike to draw attention of the public towards the deadliest disease. In 1906, the government banned white phosphorus to overcome the fatal disease. 1. Smelling of gums, loose teeth and toothaches are the common symptoms of phossy jaw. 2. With the passage of time, the pain increases and the bulging of jaw bone makes the consumption of food difficult for patients. 3. 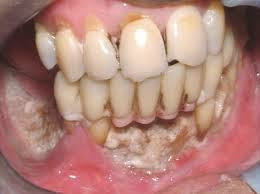 Later on, the loose teeth drop and the bone cover in gum tissues gets exposed. 4. It is astounding that affected jaw bone can flare in the darkness (color greenish white blaze). The affected one suffers with severe brain damage. 5. In fact, the phossy jaw is terribly painful and mutilating disease that has power to decompose the bone tissue and secrete a malodorous discharge. 6. The infected bone also releases pus through the skin and emits glazing effect. The Phossy jaw disease got out of control in the late 19th century among the workforce of match industry. It was a trend to use white phosphorus for producing matchsticks that could strike without using matchbox. These easy to inflame matches gained popularity. Sadly speaking, the phosphorus based sticks caused a health hazard because the makers of these match-sticks suffered from jaw bone disease. The workers were constantly exposed to lethal chemical and inhaled the white phosphorus that was the reason of bone disorder and in particular phossy jaw disease. In 2003, the disease outburst due to the use of biphosphonate in medications for osteoporosis and cancer. In past years, there was no proper medication to improve the condition of patients. Surgical treatment (removal of the jawbone) was the only solution; however the beginning of symptoms was an ongoing process and it required years to treat the affected jaw on surgical basis. Most of the patients refused to undergo surgery because of facial disfigurement, malnutrition and problem in eating. If surgical treatment was ignored, the infection used to spread to other organs. Organ failure would lead to death; therefore surgical treatment was necessary to save the patient. The treatments of Phossy jaw were unsatisfactory thus the only solution left was applying high taxes on yellow phosphorus matches in order to make production impractical.